The Seychelles is facing increasing evidence that the ocean’s natural capital is being depleted as a result of unsustainable economic activity including fisheries. A transition to sustainable fisheries is vital for ensuring that we continue to enjoy social, economic and cultural benefits from our natural capital. Sustainable fisheries will provide for our present and future needs, while also conserving fish populations and their habitats and marine ecosystems. Securing the rights of fishers to access fisheries resources is a key element in achieving sustainable fisheries. WHY DO WE NEED A TRANSITION TO SUSTAINABLE FISHERIES? Fisheries management plans must be implemented to rebuild our fish stocks and the livelihoods of fishers that depend on these resources. We recognise that in fisheries and other natural resource sectors, we need to secure a pathway to sustainably by being more conscious about the choices we make. Private sector and civil society have a major role in this new way of thinking. Fulfilling this role, however, will require a change in the way of doing business in the fisheries sector. This is because business as usual approaches fail to address the impacts of economic activity on marine ecosystems, resulting in wider socioeconomic impacts as well as declining profitability. Businesses that plan for positive environmental and social impacts in addition to economic returns now represent key partners in our efforts to transition to sustainable fisheries. Non-governmental organisations are being supported to develop local solutions for managing marine resources, providing further opportunities for partnerships and sustainable value chains. Positioning: Blue Finance is a source of funds for Seychellois who want to invest in the transition to sustainable fisheries. Through it objective, Blue Finance will be a vehicle for promoting and finance sustainable fisheries, ocean protection and the Blue Economy. Mission: Blue Finance’s mission is to finance fisheries related projects and businesses that are committed to transform the Seychelles fisheries sector to a sustainable basis. Sustainable fisheries’ is to provide social, economic and cultural growth for our present and future needs, while also conserving fish populations and their habitats and ecosystems. Vision : Blue Finance vision is for the Seychelles’ ocean to be teeming with life, and fisheries safeguarded for this and future generations. 5. Nurture new business models to secure the sustainable development of Seychelles’ fisheries. The Blue Grants Fund ($3 million) will be administered by the Seychelles Conservation & Climate Adaptation Trust(SeyCCAT). 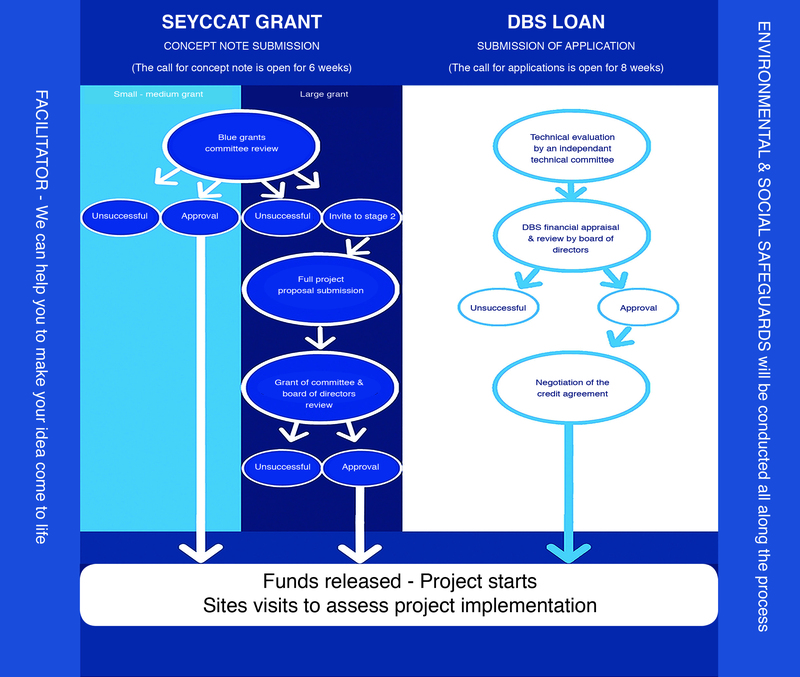 SeyCCAT is an independent, nationally based, public-private trust fund, established through the Conservation and Climate Adaptation Trust of Seychelles Act of 2015. Their vision is for Seychelles’ ocean and islands to be stewarded by the people of Seychelles, generating sustainable benefits for future generations to share. 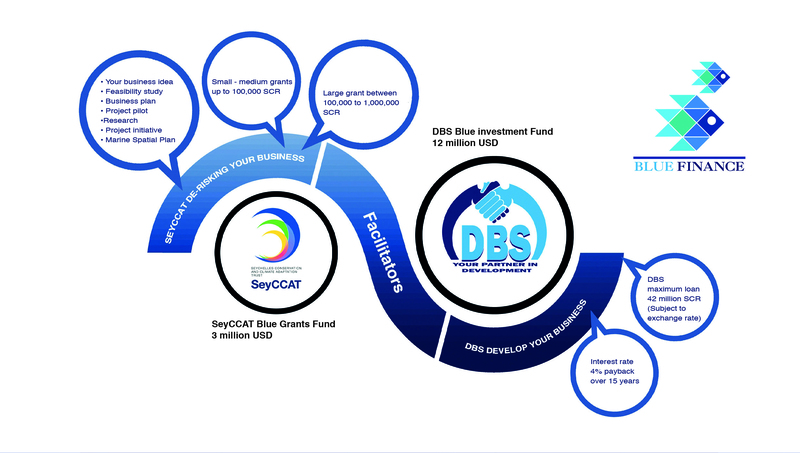 The Blue Investment Fund ($12 million) will be administered by the Development Bank of Seychelles (DBS). DBS is a national development financing institution with a specific mandate to assist in the economic development of the Seychelles. DBS’s mission is to provide affordable financing for sustainable investments in diversified and emerging sectors. Our dedicated facilitators can be there every step of the way to ensure that you receive the support you need, by way of mentoring and training, as you work through the application process. This can cover project development aspects such as technical assistance in responsible business planning and management, and project monitoring, evaluation and learning for the successful applicants when initiating their projects.